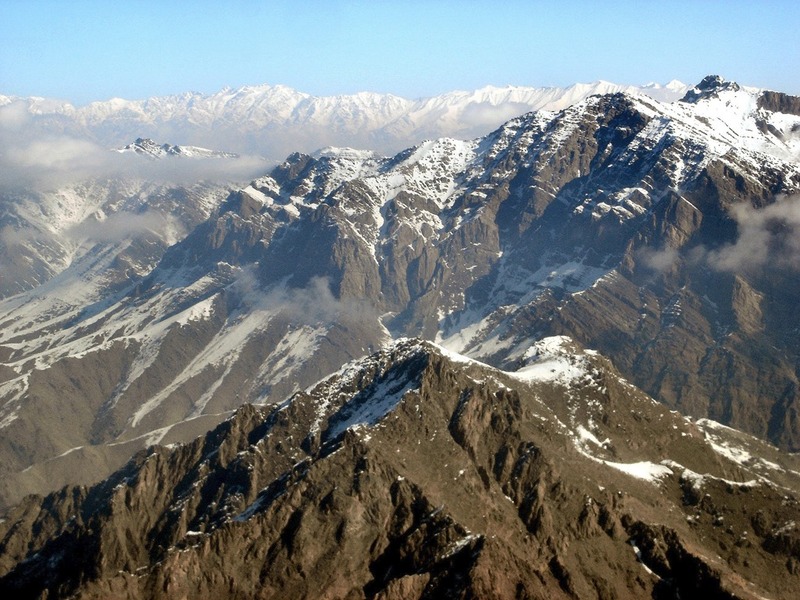 Northern Pakistan was hit by a 6.1 or possibly 6.4 earthquake this afternoon. The shaking was also felt throughout southern Afghanistan including Kabul. There’s nothing unusual about this and indeed earthquakes are pretty common in the region. They’re caused by the ongoing collision of the Indian subcontinent with the under belly of Asia. It’s a collision that’s been going on for a few million years and the crumple zone is the where the Himalayas and Hindu Kush are, indeed they are the wreckage of the collision. So much for the geology lesson. Today’s quake reminded me of yet another of the strange nights I spent in Kabul over my two long stays in the city. There were a lot of strange nights but the one I’m thinking of was in early 2005. I was living in the Tower at the Assa Guest House on Muslim Street. It’s quite a nice place as these things go and even had a swimming pool but few ever used it. At the time there was no chlorine and I don’t think the pumps worked anyway. So every few days, at least once a week, the pool would be drained of the sick looking green water and refilled with fresh. Since there was no heater for the pool either it was really like having our own ice fed mountain tarn to ourselves. I only ever saw one person use it and that for only a few minutes until his core temperature started to plummet. But it was nice. There was a flower garden around it, some pet ducks, and a recently roofed patio at the main entrance to the guesthouse. The roofing job had involved a week’s worth of welding by a couple of guys who didn’t bother too much with welding goggles. I think that most of the steel structure for the roof came from nearby demolition projects because it all had a distinctly bent and twisted look to it. The design called for an open grid of steel supports on top of which were placed large paving stones, about four feet by four feet. The idea was that the second floor residents would be able to stroll out onto their own private patio overlooking the pool and garden. And of course there were no permits or inspections or planning permission. This was Kabul where you could do anything you liked and if anyone objected you could either exercise your armed guards to make your point or just pay them off. This system is not unique to Kabul of course and has much to recommend itself. Things get done quickly. Perhaps not well or safely, but they get done which is more than I can say for where I live. I hadn’t felt anything but I was not about to argue so I was into my clothes and out the door in seconds, fully aware of the fact that I lived in a building made out of cement mixed in what amounted to a mud puddle and put together by a couple of guys whose only idea about construction came from the house next door they were trying to copy. Jericho needed trumpets, this place wouldn’t stand up to loud humming. As I rushed down the stairs with the house manager I tried to get an idea of what was going on. “How bad is it? Has anybody been hurt? Not much was making sense but when someone is yelling fire you don’t start asking a bunch of questions, you just get out. As I went through the door to the outside we were joined by an American mapping consultant who lived on the same floor as me. “Do you know anything?” I said. “Please. You stay here with the others.” the house manager said. The others were about half a dozen of the other expatriates living in the guesthouse and “here” was under the newly constructed patio roof. “Did anyone feel it? my neighbor asked the others, most of whom at this hour of the morning where still drunk from the usual evening debauch or still deeply sleep lagged. No one said anything. “No. It coming. Coming from Pakistan. Soon. Very bad.” the house manager said. Someone had figured out a way to predict earthquakes? I didn’t think so at all. Then we all started to hear the same thing at once, traffic, lots of car traffic on the other side of the compound walls. At this hour of the night there shouldn’t be any traffic at all other than the ever roaming Taliban looking for Russian or Kazakh hookers on the next street over. It sounded like midday, a constant rise and fall of badly adjusted engines and misused gear boxes punctuated by every kind of car and truck horn made in south Asia. “What the hell is going on?” No answer and we just looked at each other as if there was an answer in our faces. The house manager kept on babbling about this giant earthquake that was going to come from Pakistan and “kill millions” and there could be no doubt about the truth of it because a cleric had said so on some Pakistani radio station. It was a full blown panic fuelled by mobile phone calls and texts from Peshawar and Jalalabad. Panic is contagious and its presence nearby can ignite odd feelings in even the most rational and under control person. I think we all felt the same dread while the roaring traffic streamed by as people fled the city and the staff of the guesthouse curled up at the side of the building like frightened dogs. For a split second I think we all felt the same way. We stayed that way for perhaps a quarter of an hour, not speaking much at all, and allwondering whether this so called holy man did have something going after all. I looked and immediately felt a fright like I had tumbled off a mountain edge. The blocks were resting their entire weight, their 200 pound weight each, on the very edges of the steel rails forming the roof structure. You could see the tack welds, the temporary and very insubstantial spot welds, holding the things together. But not for long. We were out from under in fractions of a second. The house staff didn’t move and wouldn’t listen. So, we sat at the edge of the greening swimming pool in the February night and waited for the never to arrive earthquake. Someone had some Pakistan made scotch which is really just rebottled fuel oil as far as I am concerned, although don’t get me wrong I drank it too, and we waited until without a word we just all gave up and went back to our rooms. As is often the case in these kind of things, Los Angeles psychics predicting the end of the world, spoon benders claiming fraudulent powers, and dishonest journalists predicting this and that, the failure of the quake to arrive was put down to divine intervention and the fact that it didn’t happen was proof absolute that the original prediction had been true otherwise it wouldn’t have been headed off by the prayers of the faithful. It made sense to me. I guess. Almost a year later when I left Kabul that shoddy jerry-built patio roof was still standing. Anytime it rained the water would shed in torrential falls into the now glassed in patio and the staff would just shovel it outside and no one seemed to notice. The pool still went unused and you could pretty well tell what day of the week it was by the smell. And for all I knew mad clerics were still delivering their views and predictions by radio and people were still reacting to them by building rumors higher and hotter like bonfires until they swept through everything. Very much like the lunatic television and radio networks at work in North America today. But a lot of people were very badly scared that night which is really too bad for a nation that’s had two generations of war and god knows how much still to come.